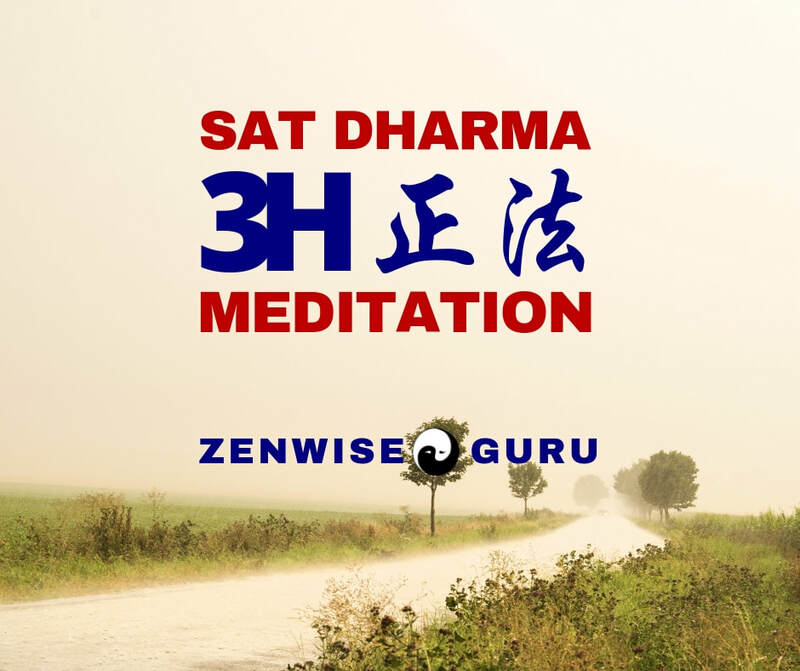 ZenWise.Guru has studied for many years in the Five Arts of classical Chinese metaphysics and Taoist, Buddhist and Confucian philosophy and practices. He has guided many, many students and clients consciously and concretely realising a more fulfilling life. Sat-Dharma-Vidya is the Buddha name of the great Bodhisattva of Compassion - Avalokiteshvara. He is the timeless witness of soul. As Avalokitasvara, she gazes at the sound of the world. Avalokiteshvara-Avalokitasvara is the inseparable tantric unity of the Self. This Oneness is the golden thread sewing together the heart of the matter, or better known as the Perfection of Wisdom Heart Sutra. In this online course, ZenWise deciphers the ancient knowledge in plain modern lingo that's easy to understand for every seeker of the timeless practice of the Three Mysteries Yoga. The following is an example of the Three Mysteries Yoga guided meditation. You are on the Path with ZenWise. Saturday Morning 8 a.m. Los Angeles time. Saturday Afternoon 4 p.m. London time. For a Taster session, please inquire for an invite. Each video lesson is about 1 hour. I really like your teaching. I practice, it becomes real. I do not have good memory even when I was young. Now I am old I cannot remember, but when I learn dharma, it's like an imprint in my mind. When you talk about meditate with shining consciousness that is a good offering to all and every Buddha, this is real teaching to me. We were talking about how much we enjoyed your Saturday talk last week on sleep. So-so said it has changed the way she sleeps and now she feels fully rested each day. I liked being able to watch your video first thing Saturday morning. I really enjoyed your last Tantra lesson and will listen to it again (and maybe again). Thank you. You're good. Your explanations of right and wrong views are on point. You explain why something doesn't work and how things work. Unlike a lot of Buddhist teachers who are dogmatic, claiming superiority of dharma with no explanation on why. Thanks. Thank you. I've listened to a few more of your broadcasts which I again found interesting, and helpful in putting some of my personal experience into context. You actually make more sense to me than anyone I've listened to in a long time. Yes! That's it! Know yourself and know your enemy(obstacles) and you will win 100 battles. It's the knowing yourself. But, you can be a detective! You can read your face and tell imbalances of the major systems by color and lines and grooves, therefore you can ascertain what imbalances are in your environment affecting you. Or vice versa. You can recognize your past life by recognizing how you have recreated it in your present life. You will find these clues on/in your body, your environment and your choices. You can discover your past life through dharma practice and by asking specific questions and trusting the answers. So maybe Feng Shui is reflected on your body, in your environment and in your pastpresentfuture. Okay. Feng Shui is more fun than I thought it would be. I have been practicing your simple but secret tips that you recommended since Saturday. I have experienced a positive change particularly with my feet already. Prior to this I was aware of poor flexibility in my ankles and corresponding feeling of poor circulation/feeling of sensation in my feet! So many thanks and blessings to you. Thank you for your Saturday Dharma talks. Although my circumstances make it difficult to be present for your course, I have been catching up and watching reruns as often as I can. Your talks are always insightful and a source of knowledge that I am very grateful to be a part of. I have been enjoying your teachings by watching reruns. The HEALING SLEEP series was particularly important for me to hear... Please continue to include teachings on the Taoist/TCM approach for health and longevity. Practitioners need to retain the 'precious vehicle' at least until greater Realization is attained... Thanks again for your generous teachings. Just wanted to say how much I enjoyed the session today. I have been wondering how all the separate elements that you have been talking about over the past months might come together, and now I can just start to see how this might be. I am very excited about this learning. I hope I can stay the course and convert learning into experience. Very many thanks to you. You are a most patient teacher. Jolly good show. Excellent Dharma lecture you gave this morning. I was reminded while you talking this morning of the book Flatland. Perhaps you know of it? The one dimensional world of Flatland visited by a sphere? I get the image sometimes that our awareness is limited by our inability to perceive ourselves in a multidimensional, fluid world, but rather, we see ourselves as living on a flat, solid plane. I was thinking of building a mandala, funny you should mention. But it can’t be a flat one, one you hang on the wall and say, ooo, how colorful. I should build it outside, using string and the compass and the star charts and the clock and calendar, and then of course, which Buddha in which direction at what time of the year. Yes. Good project. Thank you so much for this mornings talk, I can go with the flow and enjoy healing without feeling guilty afterwards. I like your style of teaching, saying how it is and not over complicating things. Thank you. I have started to look forward to your Saturday broadcasts! I love listening to what you have to say. ​I liked your TED talk. Sweet. Thank you for sharing. Thank you, Master. You have inspiring mouth words. Do you know what my name means? It means to advance through a small portal. I kinda hoped it wasn’t my own a******, but listening to you, perhaps….